S scale has its challenges compared to other scales, but one of those is definitely not a supply of good vehicles. 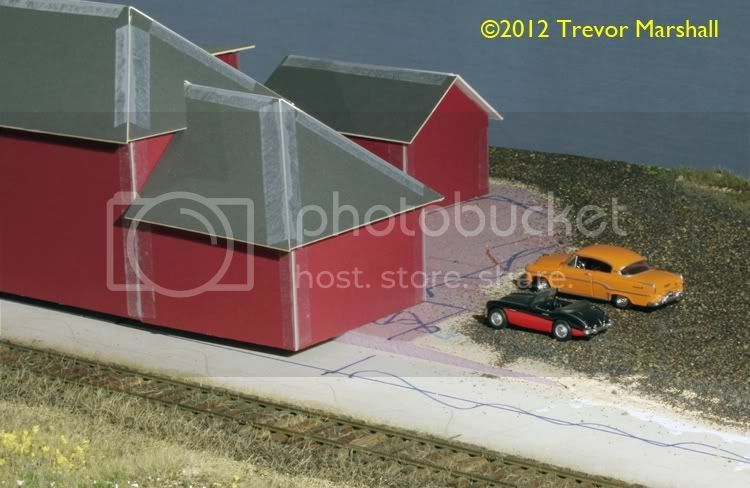 Case in point, today’s mail brought a bucket o’ M2 Auto-Thentics, delightful die cast that’s perfect for a 1950s layout. I’m fortunate in that Port Rowan was a summer vacation destination for wealthy Americans (and Canadians), so even models in vibrant paint schemes with top-trim features look at home on the roads. Most of these came via Amazon, in sets. But if you’re looking for some, Hoquat Hobbies in New Jersey has an extensive listing, with pictures, on this web page. That about does me for cars, I think – but I will need to find some more trucks, including commercial vehicles, to park at team tracks. 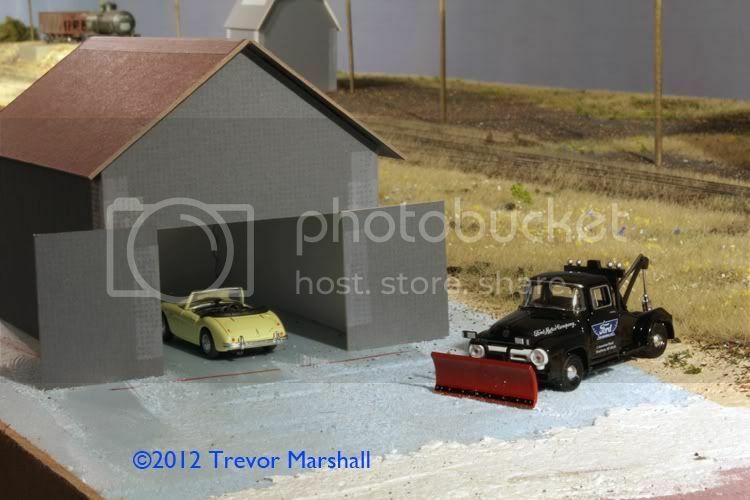 This entry was posted in figures vehicles and other details, scenery by Trevor. Bookmark the permalink. 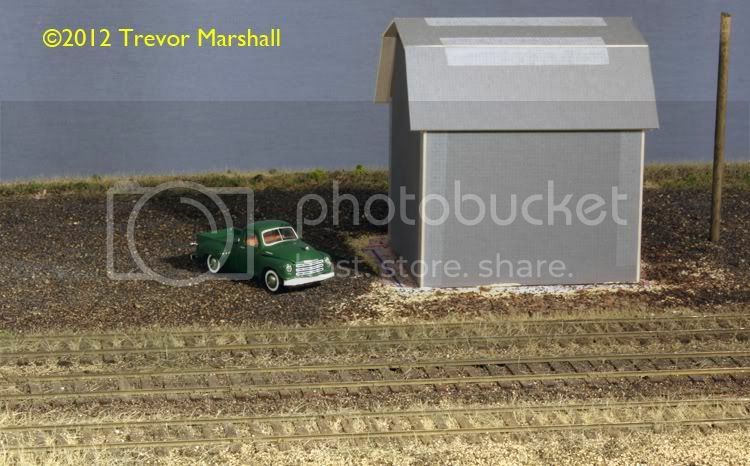 I’m a car junkie and have more vehicles than I could ever use on my layout, but if someone came out with some Canadian Fords, I wouldn’t be able to resist. I still remember seeing Monarchs, Meteors, and Mercury trucks in the 50s and early 60s. I’d buy a bunch of those if they came out in S! I will probably have to remove half of the vehicles shown in the photos accompanying this post. It’s too crowded. I will rotate them onto the layout as the mood strikes. I doubt we’ll see Canadian models – too small a market. 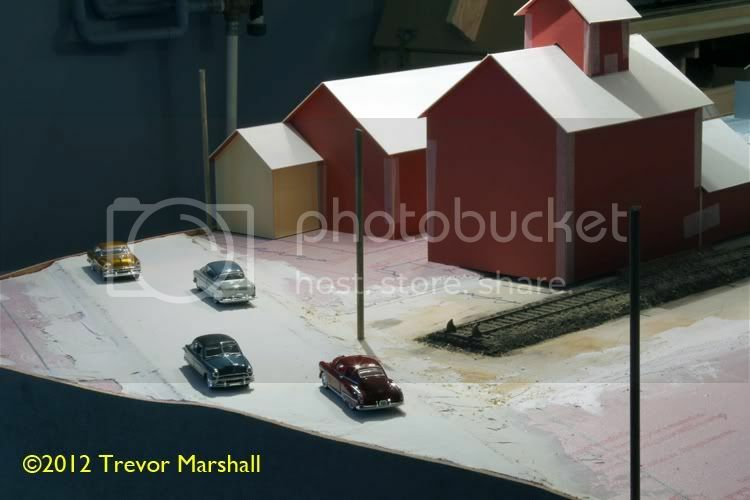 Maybe we can convince Clare Gilbert at Sylvan Scale Models to do some vehicles in 1:64? I never saw a Mercury truck outside of Canada, but the cars were seen often enough in New England. I’d think they’d sell as a curiosity if nothing else, and to us car nuts. 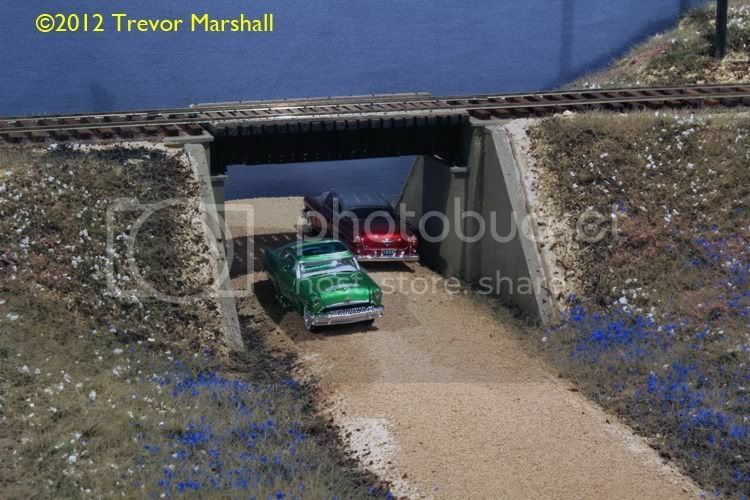 Love the weeds along the track in Port Rowan and I will have to contact you for advice when I build my layout. After talking with Bill Hammond awhile back concerning his father’s business(Hammond’s Mill) and siding in St.Williams , he informed me that they had a small coal shute between some ties on their crossing that allowed them to use a small elevator to unload coal from hoppers unto their truck for home delivery.Sometimes when a rail car was unloaded and they expected another to be set off on their siding, they would go to the station in St.Williams to receive the switch key from the station agent. 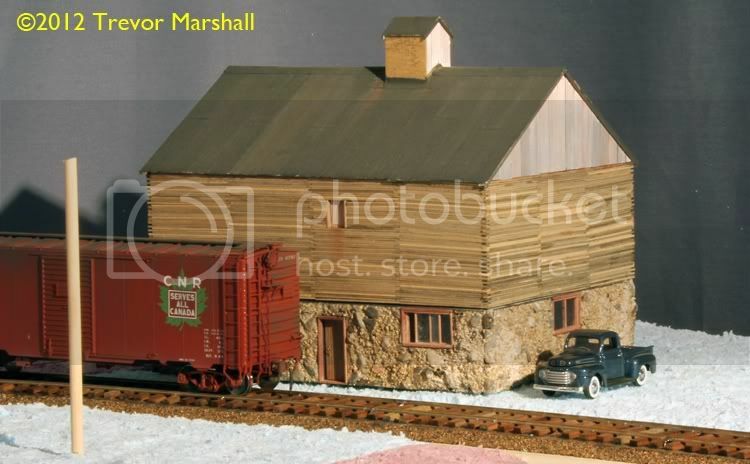 After the westbound mixed train passed the switch they would use car jacks to move the car out to the main lineand leave it.Upon its return, the train would couple and push the empty down to the team track at the station after setting off their load (boxcar or hopper ) in the siding. Have not heard of this before? Assume the mill received a discount on their shipping costs due to saving a switch especially as the mill’s location would have caused them to block a crossing over five minutes as they uncoupled the engine from the rest of their train and left it on or just west of the road crossing. Interesting move! Incidently, this siding was put in in 1946 with heavier rail than the 80 lb Barrow Steel used on the main line. On another topic, I hope Trevor that you and your group will employ farm crossings within your track work as these were quite plentiful all along the line. The grass gets a lot of compliments. Thanks! It’s very easy to do – although it does require locomotives with all-wheel pick-up for operating reliability. That’s an interesting story about moving cars onto the main. I’m not sure how I’d replicate that on the layout – but I do advise crews to switch the spur at St. Williams on the trip down to Port Rowan, but leave any lifts on the siding to pick up on the way back to Simcoe/Hamilton. This keeps extra cars out of Port Rowan itself, where space on the double-ended siding is at a premium. So far, I have one farm crossing at the orchard in Port Rowan. I could probably model another one near the exit to the sector plate, north of St. Williams. But I’m not sure if I have any more space for them on the layout. Most of the run between towns is in the Lynn Valley, along the river. But we’ll see how the scenery develops. Thanks Monte – me too! I should clarify that my Lynn Valley scene is mostly taken up by two river crossings, so I don’t even have level spaces to suggest farm fields. I do have a cowpath between the trees to reach the river at one point – but no place where a farm crossing makes sense. I wish I had more room – don’t we all? But unlike most, I’d use it to broaden my curve radius, and use it for single track through the countryside to extend the run between staging, St. Williams, and Port Rowan.